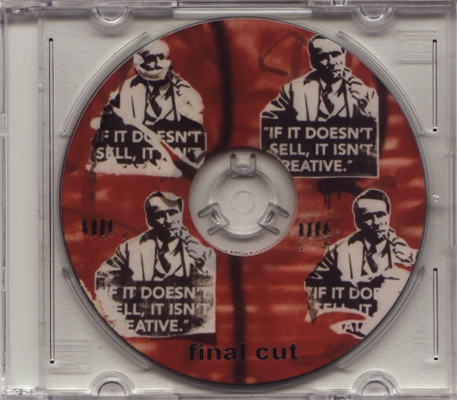 Belgium based Final Cut offers two piercing drones on this 3″ mini album, ranking as one of Taalem’s many fine releases. “Ballade de Bruits” and “Radiotherapie” were created from various field recordings, which were then taken to the lab at home and reassembled as the intense, unyielding, hypnotizing drones that are bombarding my room right now. Final Cut’s consistent hammering of bleak overtones and juggernaut feedbacks is driving all logic and reason away from the room, filling the space with meditative resonance that almost feels solid enough to make it hard to breath. “Sound is all”, so the artist wrote. For now it most defiantly is. The two tracks do have differences between them, and only together can they complete a full circle within this intense aural trip. Ballade de Bruits opens with a more stormy vibration, forming a hostile environment that only grows more and more in density and presence. The infinitely feedbacked sounds create a mind piercing, yet somehow delicate and intimate singing sensation, as if the conclusion of such heavy weight of sound that Final Cut is putting on my shoulder is lyrical and almost angelic. After this demanding experience, “Radiotherapie” offers itself to me as a soothing treatment for the heavy emotional trauma caused by the first part of the album. “Radiotherapie” is as intense as its predecessor, yet more forgiving, fading away together with the intense experience that was created by these two tracks. When it finally dies, I am shaken out of this stirring experience and can barely remember details from it. Another play of this album is in order, so I can trace back my feelings and thoughts. Before I do that I take notice of how my house is silent now, empty without the deep sounds that dominated it just few seconds ago. It’s easier to breathe now, and I take a deep breath, pressing play again and feeling the soundwaves pressing against my skin once more. Another excellent release from Taalem!